Our first walk had ended at Ness Road in Shoeburyness, so this was where our second walk started. 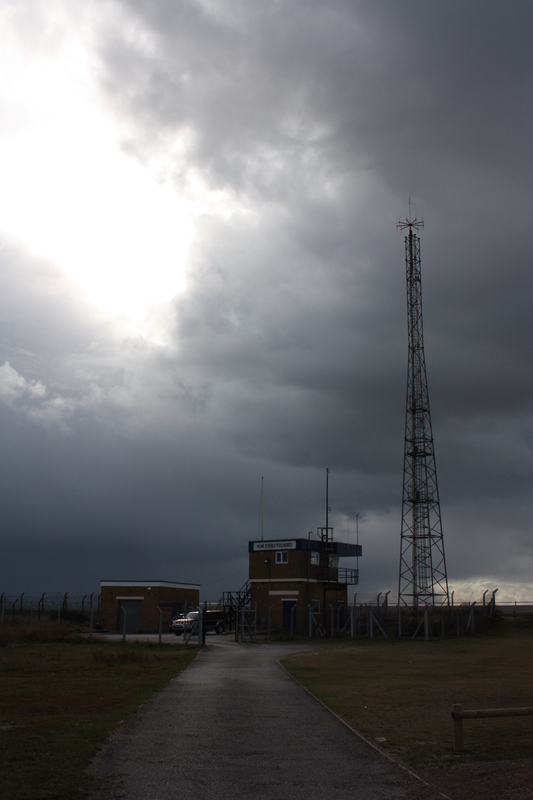 At the end of Ness Road, behind the sea wall, is an HM Coastguard Station. This looked very dramatic on the day of our walk, standing against a backdrop of deep grey cloud, yet with the sun fighting to shine through from behind. This set the scene for the entire walk. It tried very hard to rain all day. The wind whipped at us and the waves crashed at us, but the rain stayed away. Eventually the blue sky pushed away the cloud, though not before we had walked a mile or two. Even so, by the end of the day the rain had its sweet revenge on us, soaking us through in our final five minutes, and causing us to abandon our stroll along Southend-on-Sea Pier. Shoebury Common Beach lies to the west of Ness Road and leads west into the Thorpe Bay area. 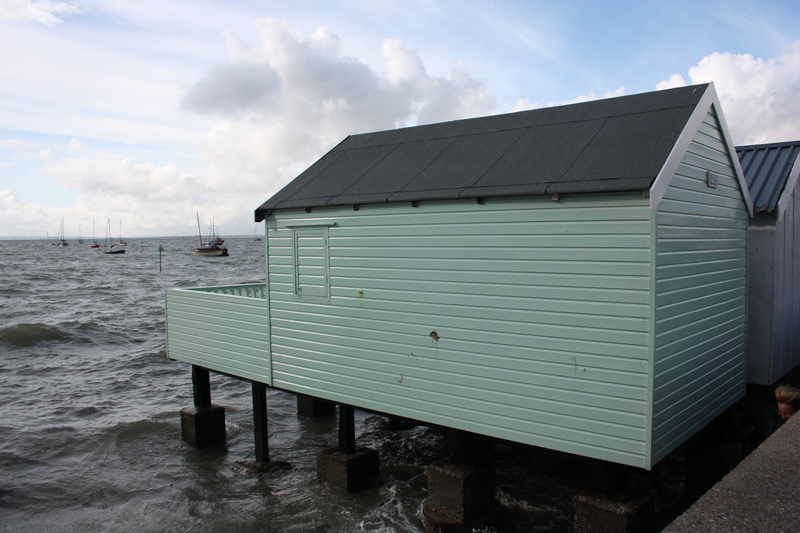 Thorpe Bay is the wealthier suburb of Southend-on-Sea, and the prices of the beach huts which line the front illustrate this – websites advertise huts for sale at prices between £21,000 and £24,500. Many seem to be large and plush, standing on stilts so as to avoid the tide, which comes in right up to the sea wall and laps underneath them. Many have verandas and other features. The Thorpe Bay houses which stand behind, set back from the main road by the common, are also quite grand, and the area has its own yacht club. As we walked along the sea wall and were hit by the foam of the crashing waves the seagulls wheeled around us, quite at home in this blustery weather. The tide was fully in, yet at certain points did not come right up to the sea wall, allowing us to walk along the pebbly beach. The further west we walked, the more beach became available. 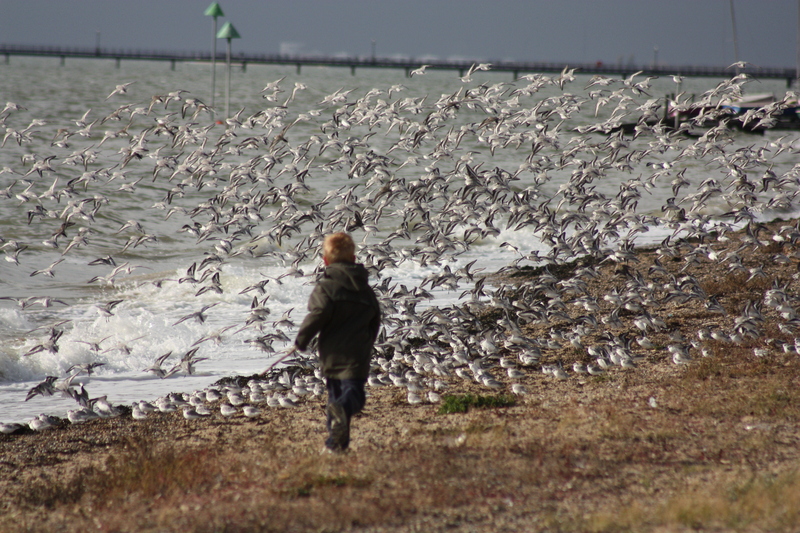 Flocks of small birds stood at the water’s edge, allowing my son to indulge in one of his favourite pastimes, running headlong into them and scaring them off. On the approach into Southend is Corporation Pier, also known as “Gas Jetty”. This was built in 1914 and used for unloading barges and lighters. A firing point was added in World War II. Eventually, trade began to decline in the 1960’s and the pier was then leased out to private businesses. Last used in the 1980’s, it then fell into disrepair, becoming so dilapidated that it was deemed unsafe and closed to the public. From pictures on the internet it appears both impressive and an eyesore at the same time. In 2007 it was demolished. All that is left today are the heavy steel gates in the sea wall (still locked), and a short stretch of concrete base across the beach. The pier itself is completely gone and there is not much to see now. There is, however, a good view looking towards Southend-on-Sea Pier, stretching out into the sea, with its train slowly making its way from one end to the other. Southend-on-Sea itself started life as an offshoot of the nearby Prittlewell Vilage, one of the oldest villages in Essex, where a priory had been founded in 1110 AD. Southend was, quite literally, the south end of the village, home to a few fishing huts only, from which it received its name. It was not until 1842 that Southend became a parish in its own right. It was in the 19th Century that the town began to grow as a resort, particularly when its pier was completed, thereby allowing ships to set their tourists down. In Victorian times, the main Southend attraction was The Kursaal. Built in 1901 as a ballroom, it expanded to 26 acres at its peak, boasting rides, gardens, greenhouses and many other attractions. However, as cheap package holidays became more available in the 1960’s, business declined and The Kursaal eventually closed. It was bought by the Council in 1998 and is now home to a bowling centre, casino, and the most modern of conveniences: a Tesco Express. It is no longer the main attraction of the town. That crown has passed to the pier and (my kids will tell you) the Adventure Island theme park at the pier’s foot. Indeed, we started our walk around the coast of Britain in the Southend area purely because of Adventure Island. We figured the kids would put up with the walking if there was a roller coaster awaiting them at the finish, and we were right – time to hit the pier! 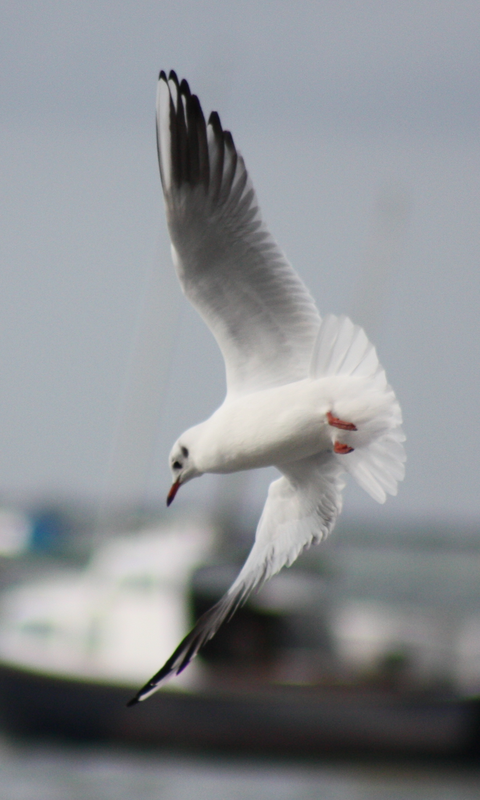 This entry was posted in Essex and tagged coast, Essex, Shoebury, Shoeburyness, Southend, travel, walking. Bookmark the permalink. Hi Jill! I have no idea how long it will take – with two 9 year olds we’re not doing huge slugs of it at the moment. It’s one of those “rest of your lives” projects for now, but we’ll slowly work our way round. Yes, the geocaching is pretty good round the coast. My county map should be lighting up as we go!